It was early May. The day was warm, yes even bordering on hot, and I was doing what man was intended to do on a warm day in early May. I was fly fishing for trout. It does not matter where I was fishing...the where is unimportant...the fact that I was fishing is the important part. It had been a wonderful day. An exceptional day. It had been a fishless day. Not that a fishless day is exceptional or wonderful, for me fishless days are not the exception, more often they are the rule. It was a wonderful day and an exceptional day because I was fishing. Not just fishing, but privileged to be fishing. Privileged to have the time and the expendable income to enjoy this most wonderful sport. Privileged to live in a land where trout streams are available to the common man, where wild trout still live and men like me are permitted to pursue them. I have fished for trout, in one form or another, for over 45 years. From casting hooks baited with worms back under the banks of small creeks near my home in upstate New York, to casting size #28 Tricos to brown trout on Michigan's Au Sable, I have pursued trout from coast to coast. Over those years there have been some memorable trout that have fallen victim to my skills. The slab sided rainbow that took my stone fly nymph as it drifted through a small side channel on the Yellowstone River one late March afternoon. The brown trout that rose to my fly the last time I fished Michigan's Au Sable River before I moved away to Montana. The magnificent cutthroat that materialized out of the depths of a crystal clear pool and sucked in my drifting dry fly. However, what has remained with me over the years is not the fish that I have caught, but the enjoyment I have received in the pursuit. 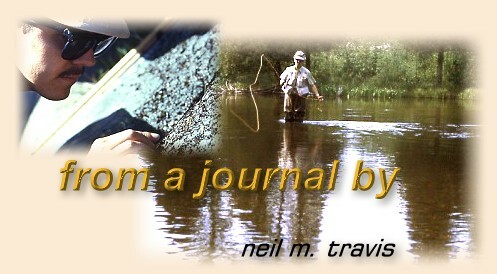 Fly fishing for trout has enriched my life. Some would say that it is foolish to romanticize the sport of fly fishing, that fly fishing is just a blood sport that modern man has sanitized. Some would say that there is nothing noble about fly fishing, nothing ennobling about catching fish with feathers instead of bait. Perhaps they are right, but I fear that in our attempt to strip the sport of its romanticized roots we have lost something in the translation. Last spring I was fishing one of the famous trout rivers here in Montana, and during the course of the day I was struck by one singular fact: there were lots of people fishing, but no one seemed to be having fun. It was all very serious and mechanical. I heard no laughter, no joking or convivial conversation, just the steady, measured, metronome-like strokes as each angler plied his/her flies upon the water. Later, at dinner, the conversation focused on the number and size of the trout that had been secured by such business-like angling. I ate in silence, not willing to expose my own lack of "angling success" to such a group. After dinner I strolled outside, as much to escape the conversation as to catch a breath of fresh air. As I listened to the owls talking in the cotton-woods down by the river, I marveled at the sky filled with stars. In the darkness the wind wafted the fresh smell of spring to my waiting nostrils, and I quietly gave thanks that I was privileged to be present to see it happen.